Wedge Roofing's Marin County Eichler spray foam roofing work won the 2015 National Industry Excellence Award from the Spray Polyurethane Foam Alliance (SPFA) for Best Spray Foam Roof nationwide under 40,000 square feet. Nominations were judged on the value for money, speed of delivery, environmental sustainability, innovation, best practices, problem-solving, and risk mitigation. Nominations were judged independently by a national panel of industry experts. As a SPFA Certified Spray Foam Contractor with Advanced Level Master Installers and Project Managers, plus Rooftop Solar Energy Certification from the National Roofing Contractors Association, Wedge Roofing was uniquely qualified to meet the complex demands of this project. Wedge Roofing President Ralph Wedge and General Manager Gary Harvey accept the 2015 National Industry Excellence Award from the Spray Polyurethane Foam Alliance. Installation of a highly insulated spray foam roofing system providing energy-efficiency, temperature control and sound deadening properties in an open beam roof design. Implementation of expansive rooftop photovoltaic and solar hot-water heating system. Integration of telecommunications and fiber-optics infrastructure. Historically accurate roof restoration of the 1950’s Eichler residence and enhancement of curbside appeal. Accordance with California’s Title 24 energy efficient codes and Marin County’s Wildlife Urban Interface (WUI) requirements. 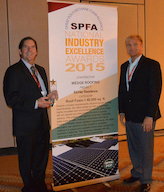 Wedge Roofing would like to thank the SPFA for this esteemed award; we are truly honored to have received the 2015 National Industry Excellence Award for our spray foam roof project. We also want to acknowledge the dedication and hard work of our General Manager, Gary Harvey without whom this award would not be possible, and the entire Wedge Spray Foam Division for their dedication to quality spray foam roofing and insulation. The SPFA is the voice and educational arm of the polyurethane foam industry. SPFA delivers training, industry certification, leadership on energy conservation, the environment, health & safety, building codes and technical advances in the industry. Members are professional contractors, manufacturers and distributors who strive to educate, regulate and improve the trade. I am able to sleep better after hiring Wedge and knowing that the proper roof I now have is worth what I paid. "